Attention all Shopaholics! Now there is a place where you can be welcomed with open arms! 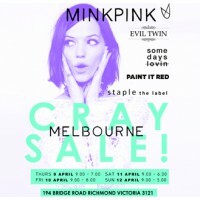 Landes Warehouse will be hosting the Official Mink Pink Warehouse Sale from April 9th to April12th, with new stock being put out every day! 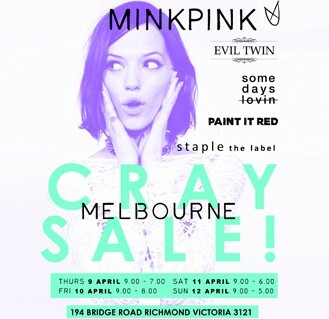 Shop till you drop, rock out to some live music, take advantage of the 80% off designer labels such as Mink Pink, Some Days Lovin', Paint it Red and More! Have some photo fun with your gal pals in our very own Photo Booth and find all the trans seasonal pieces you need for any weather. Bring your girlfriends, drag your boyfriend along and prepare for the shopping experience of the season.